RAMPALAKOS A.A. is a company which manufactures and trades AGRICULTURAL MACHINERY with emphasis in olive harvesters and rods. Rampalakos Industry represents major foreign companies, offering a wide variety of products and machinery. For the construction of our productrs only high quality materials are used. We represent companies with global prestige and recognition, with tested and reliable agricultural machinery. 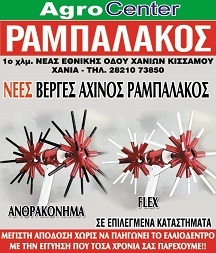 In our exhibition you will find their products. Our company provides service to all agricultural machinery. We undertake all kinds of machinery of all companies.